Camping La Falaise er en campingplads i La Turballe, Loire-Atlantique, beliggende ved havet. Denne campingplads har pladser der er afmærkede, med skygge, uden skygge og pladser med en smule skygge.Camping La Falaise ligger tæt ved en sandstrand. Det er muligt at leje mobil homes. Campingpladset har et sportsområde. For den sporty feriegæst har campingpladsen forskellige cykelruter.Campingpladsen har en indendørs swimmingpool med skydetag og et børnebassin.I de nærmeste omgivelser kan du svømme i havet.På Camping La Falaise er det muligt at snorkle, windsurfe og stå på vandski. Du behøver ikke altid selv stå for madlavningen, for på campingpladsen er der en snackbar og et pizzeria aanwezig.På campingpladsen kan du også købe frisk brød.Du har mulighed for at gå på Internettet, for campingpladsen råder over en eller flere computere med internetforbindelse og for på 80 % af campingpladsen kan du koble dig på Internettet med din egen computer. Denne inspektør besøger hvert år Camping La Falaise og inspicerer campingpladsen ud fra omtrent 200 faciliteter og andre fokusområder. Inspektøren arbejder for ACSI og arbejder altså ikke for campingpladsen. A wonderful friendly site right on the sandy beach. Good food in the outdoor dining area. Excellent facilities. This was our third visit. This is a very popular site and well deservedly so. We arrived on 2nd July and there was only one pitch available for that night but we could move the following day to a better one, which we did without any fuss. The pitches are a reasonable size standing on sandy ground and mostly separated by low hedges or rustic fences and most seem to have water and electricity on site. The soft sandy beach is accessible directly from the site and the sea could be heard from our pitch that was within 25 yards of the beach. The site seemed to be full every night with a steady flow of arrivals and departures every day. The small indoor swimming pool under a glass roof is kept at 28 degrees so was amongst the warmest we have experienced. In high season it would probably be rather crowded. The small Snack Bar which has only 4 tables for eating in, had a limited menu but whatever they did looked good. I had the Oriental Platter and Hils had Moules and Frites, all of which was very enjoyable. The take-away frites were excellent and generous. The usual range of bread was available from 8:00am each morning if ordered the day before, and was a bit on the dear side, but the Super U was a short walk away so that was another option. We would certainly visit again. Compact site with varying size pitches.gets busy so need to book. Several groups had to move pitch due to bookings for a particular pitch. Bar is good value friendly with good snacks. A nice site, right on the beach if that\'s what you like. The week we were there it was in the 30\'s. Very little shade on our pitch but we coped. A short walk into the Village was nice, Bars and eateries were available. 2 minutes and you are in the SuperU too! We took our two Westies, disappointed to find out there are no dog friendly beaches in France after 15th June. The owner Laurant could not have been more helpful ! Extremely clean & modern facilities. The snack bar was most useful. Supermarket within walking distance. A bonus for Motorhomes onsite car hire very reasonable rate per day. This site is now the victim of its own success as out of season you have to book to guarantee a pitch. Great location right by a beautiful beach. Super facilities and a nice indoor heated pool. The snack bar is also very popular and run by some friendly staff. Pitches are a good size and it's a peaceful place to be. Short walk into la turballe which is a pleasant fishing port with plenty of restaurants and bars. excellent site with very helpful staff.good size pitches. site on the beach and a short walk into LA TURBALLE. will be back again no problem. We stayed at this delightful campsite for 10 days and were a little unlucky with the weather. But as this was our 3rd visit to La Falaise we knew where to go on windy and wet days. I do not know of any other campsite that matches such a fantastic location with truly attentive and helpful staff. Great site, some pitches a bit tight for larger vans. Toilets & showers excellent as was heated pool. Had intended to stay just 2 nights but in the end stayed for 8. Plenty of oysters & muscles available to collect from rocks. Village a short walk and Super U just down the road. Would definitely come again but think you must book in high season as was full for most of our stay. What a great location for this delightful campsite. Right on the beach of clean golden sands and crystal clear water. Not overly large, but a site with a convivial and friendly atmosphere. Excellent toilet and shower facilities and a nice indoor swimming pool. The owner is very nice and accommodating and we enjoyed the nearby villages, each with their own harbours and marinas. A great site to relax. Vil du booke Camping La Falaise eller have yderligere information? Det kan du via nedenstående oplysninger eller via campingpladsens hjemmeside. N165/E60 Vannes-Nantes, frakørsel Guérande/La Baule. Ad D774 til Guérande, ad D99 til La Turballe. Følg ved ankomst til byen skiltene mod campingpladsen eller Super U på D99. 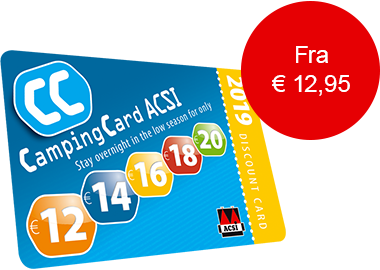 ACSI Eurocampings sender din forespørgsel videre til "Camping La Falaise".